Sexagenarian action star and heart-throb Liam Neeson has revealed that the inspiration for the ‘Taken’ movie franchise, which has launched him to stratospheric levels of stardom, was a letter he happened upon by chance during the shooting of Neil Jordan’s 1996 epic ‘Michael Collins’, in which he played the eponymous Irish Leader. Neeson explains that they were filming in a house in Clonakilty, County Cork, where Collins was known to have taken refuge. The typewritten letter was from none other than Collins himself and addressed to King George V, though it clearly never reached its intended recipient. The letter is in surprisingly good condition, though the paper has discolored significantly. It written entirely in English, presumably for clarity, but Collins signs it using the Gaelic form of his name. The inspiration for the Taken movies is immediately apparent, as the famous speech that Neeson would deliver almost one hundred years later before ruthlessly dispatching untold numbers of bad guys is lifted almost word for word. I do not know you. I do not know what you want. If you are looking for ransom, I can tell you I do not have any money. But what I do have are a very particular set of skills; skills that make me a nightmare for people like you. If you give my country back now, that will be the end of it. I will not look for you, I will not pursue you. But if you do not return it, I will look for you, I will find you, and I will kill you. 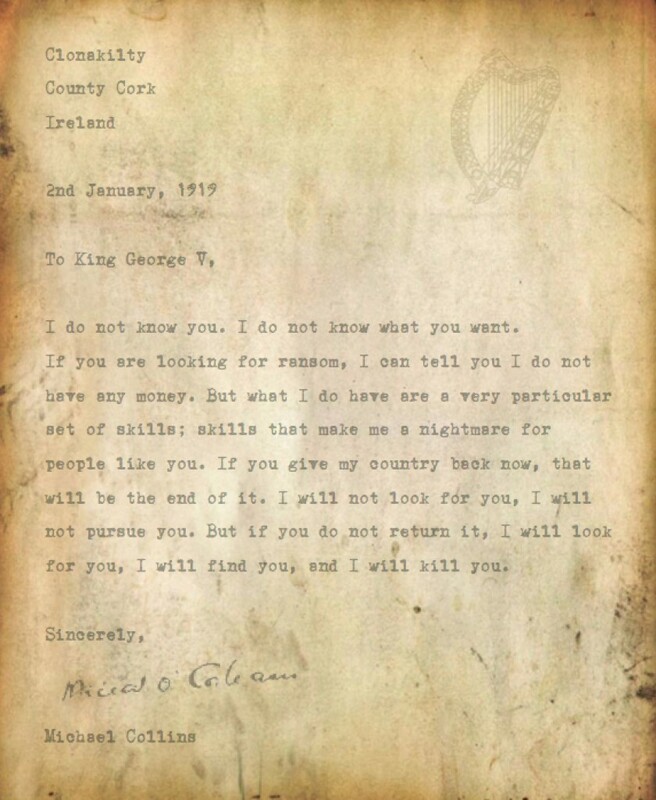 A spokesperson for Buckingham Palace speculated that if the letter had found it’s way to the King the whole Irish War of Independence and the resulting Irish Civil War might have been averted. Though Collins did not succeed in locating and terminating the English Monarch, he did wage a successful campaign against his Crown forces in Ireland, leading to the creation of the Irish Free State in 1922, though he was killed in the Civil War that followed shortly thereafter. Neeson points out that, despite their reputation as air-headed entertainment, the Taken movies were conceived as a parable for the convoluted issue of Anglo-Irish relations, except for Taken 3, which is clearly a polemic on the intractable complications of the Middle East problem. Neeson is grateful to Collins for his latter day fame as a man of action, which he clearly enjoys, though he admits with the sheer amount of movies he is making it can be difficult to stay grounded. He cites a recent incident in France while shooting a restaurant scene in which a mother calls out for her missing child. The mother was happy to have her daughter back, but not ecstatically so, as it turns our her only concern was that the young girl’s food was getting cold. It was then that Neeson realized there was no film crew in sight, and remembered that he was on vacation. Digital scan of the letter Neeson found while looking for breath mints. 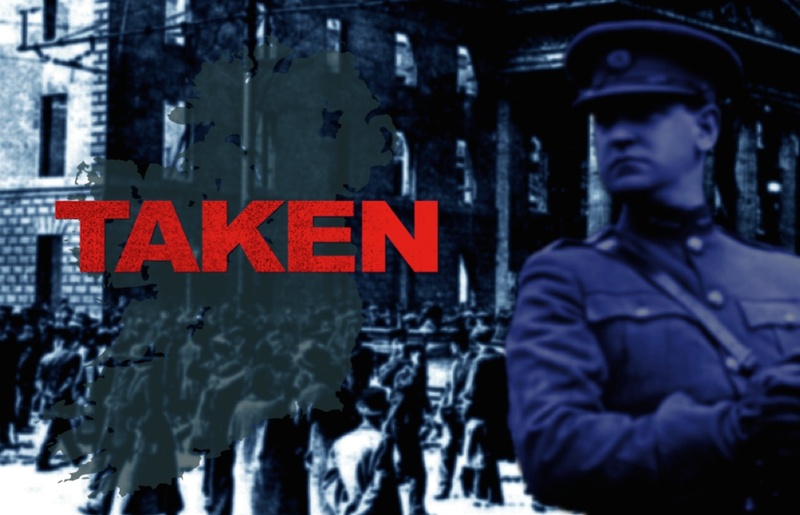 Be the first to comment on "Liam Neeson Reveals ‘Taken’ Movie Franchise was Inspired by Letter from Michael Collins to King George V"